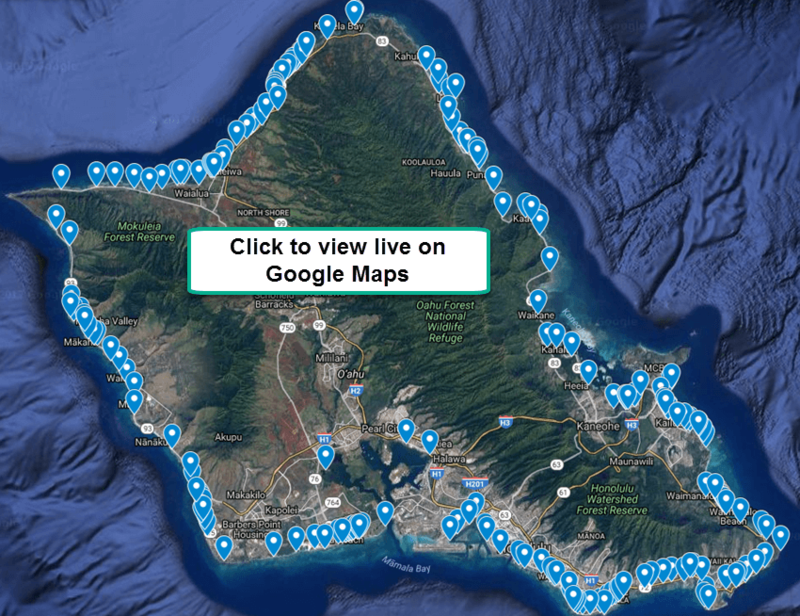 "One of the best sites, not in Hawaii, but probably the whole USA"
"Provides data we like to see * User-friendly and the most informative"
View exclusive Oahu Real Estate info found nowhere else! Great photos are the #1 thing all buyers want to see. The large HD photo below is the size we show on our website. Below the large HD photo, you will see the size shown on other websites. Even on a mobile phone you can see a huge difference in quality when pinching out to zoom in on the photo. Viewing large HD photos allow you to see details you do not notice with the smaller images. 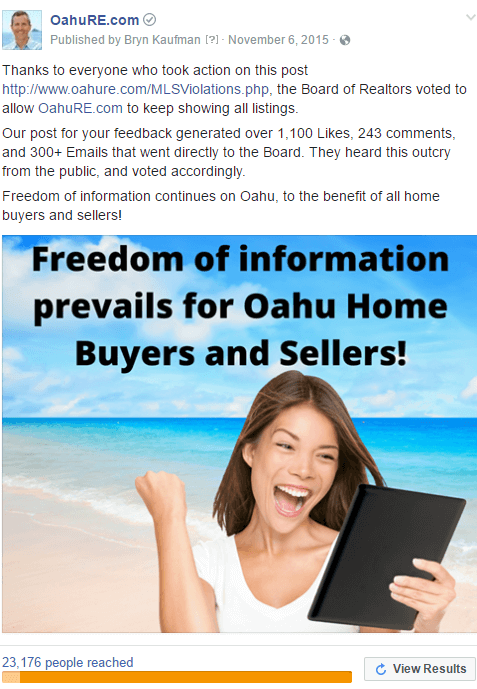 When the Board of Realtors told OahuRE.com to hide all pending, withdrawn, and expired listings, we asked our raving fans for help. They responded and sent a strong message to the Board through 300+ emails, 280+ Facebook comments, and 1,100 likes on our Facebook post. 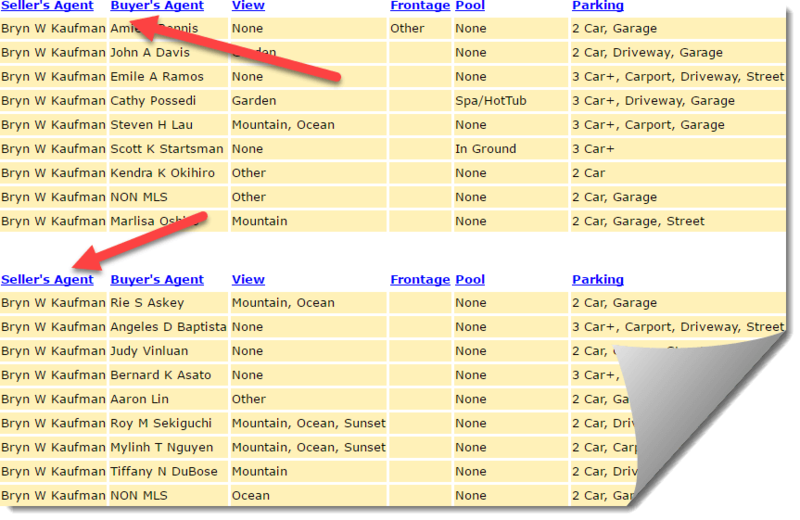 The Board of Realtors then reversed their decision and now allows OahuRE.com to show all listings. We would like to say, "Thank You!" to our raving fans for supporting OahuRE.com and making sure buyers and sellers continue to have access to all listings. "MLS Listings Go Public. OahuRE offers consumers unfettered access to MLS. ...unlocks a trove of information from the Multiple Listing Service." "A guilty pleasure. At your fingertips are reams of data on the real estate market. Even if you’re not actively looking to buy or sell a house, a visit to the real estate Web site OahuRE.com is an informative and fascinating experience." 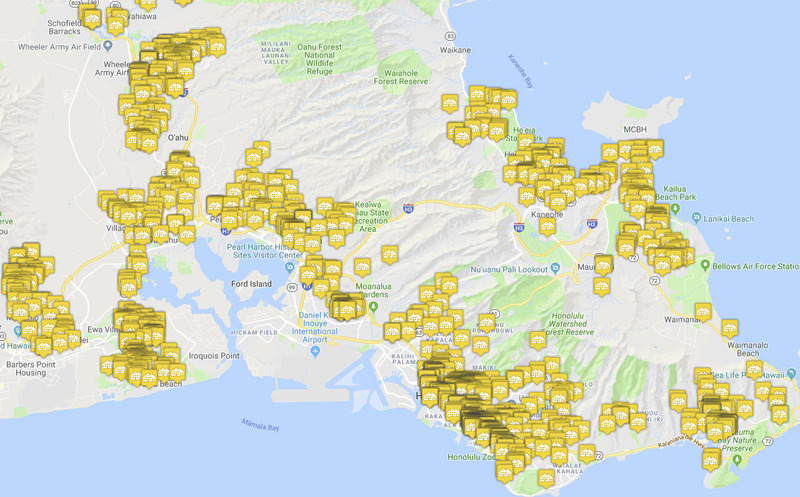 "A popular website that provides consumers free access to detailed Oahu home-sale listings is under fire from the organization governing Honolulu real estate agents over the amount of information it shares with the public." 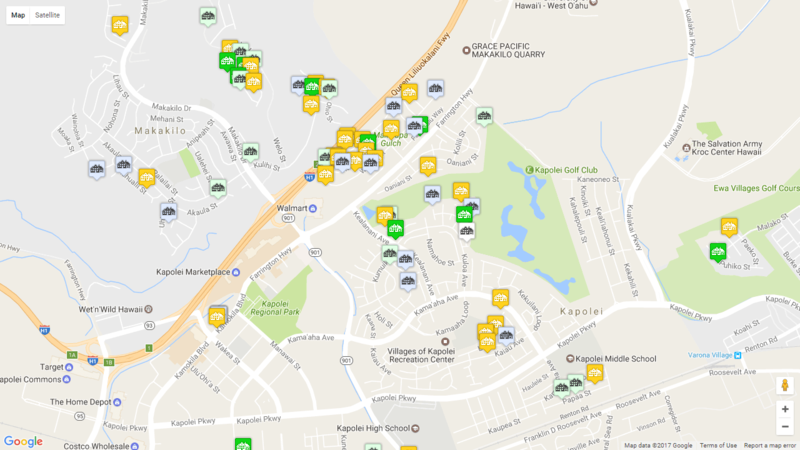 View 1,000+ homes we sold on Google Maps. On other websites, you might notice homes you are interested in disappearing. This is because they do not show you all status options. 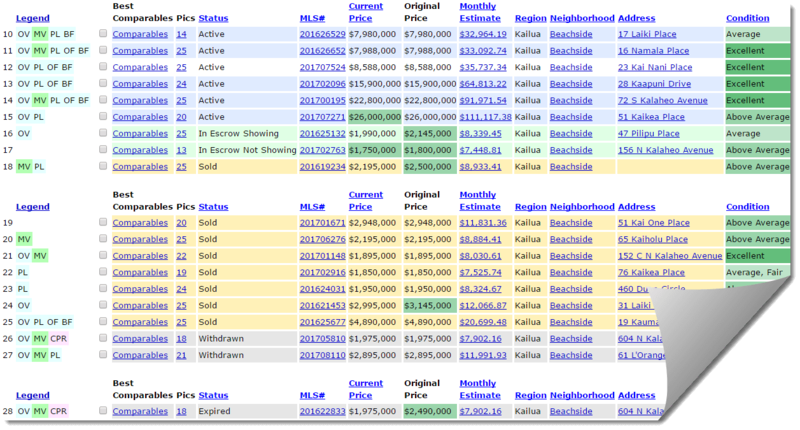 For example, Zillow and Trulia do not show In Escrow Not Showing and Withdrawn. If a home goes into one of those status options, it simply disappears from their site. We show you everything, so nothing disappears, and you can get a complete set of comparables with nothing missing. Another example as of June 2017 HiCentral was showing 23,138 listings compared to 254,542 listings we are showing. We do not hide listings. 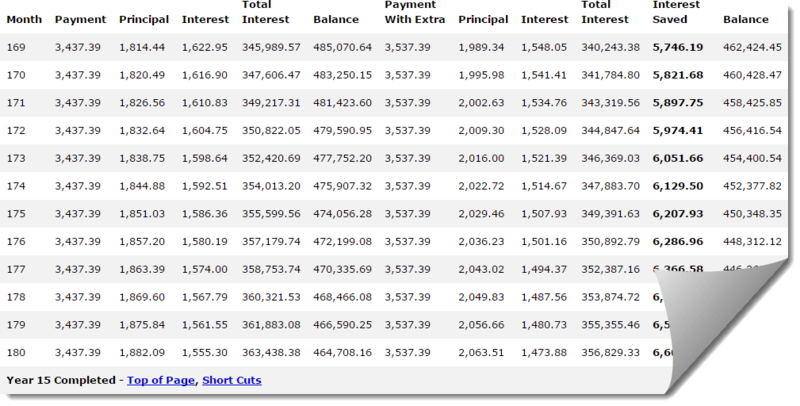 You can save thousands by using our spreadsheet like Comparables View to analyze the comparables. 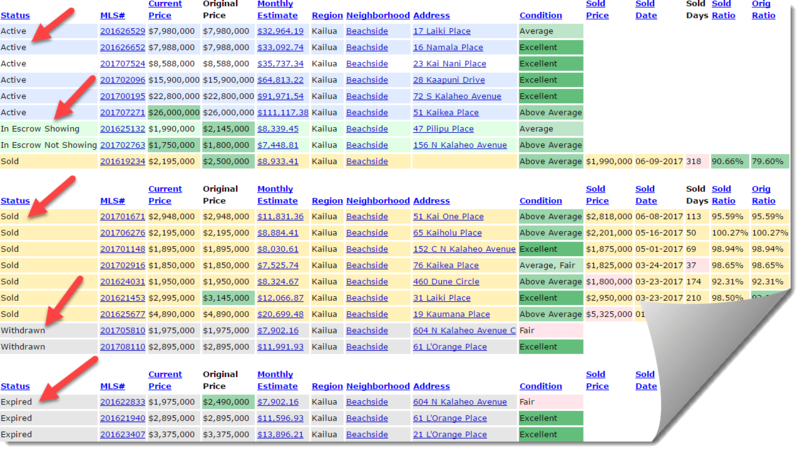 Appraisers, Realtors, and the City & County of Honolulu use our comparable view to help determine home values. Having good comparables is one of the most important pieces of information a buyer or seller need. Without good comparables, sellers might price their home wrong and see their property not sell, or price too low and see it sell for less than they could have received. A buyer without good comparables might end up paying too much for a property. We provide a range of options as shown below to give you good comparables with only 1 click. Using these options, the computer does the hard work for you by analyzing various search options and comes up with the best comparables available. To properly negotiate, you must know the sales history. Our sold listings go back to 1993. You will really understand the history of a neighborhood, specific property, or building using this data. You also need the complete history with nothing missing to make a good decision. We show In Escrow Showing, In Escrow Not Showing, Expired, Withdrawn, and Canceled listings to give you the complete history. View Live Example. 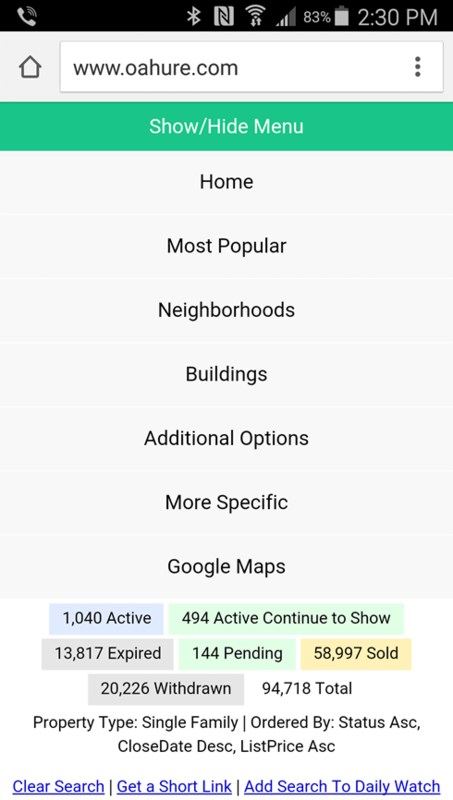 When viewing any listing, with just one click, you can see a 15-year history of a that listing's Neighborhood, Street, or Building. We filter the results, so the listings shown are close to the listing you are currently evaluating. This is a great way to understand the history, as you can see if prices have increased or decreased. This view shows you all results color coded on Google Maps. 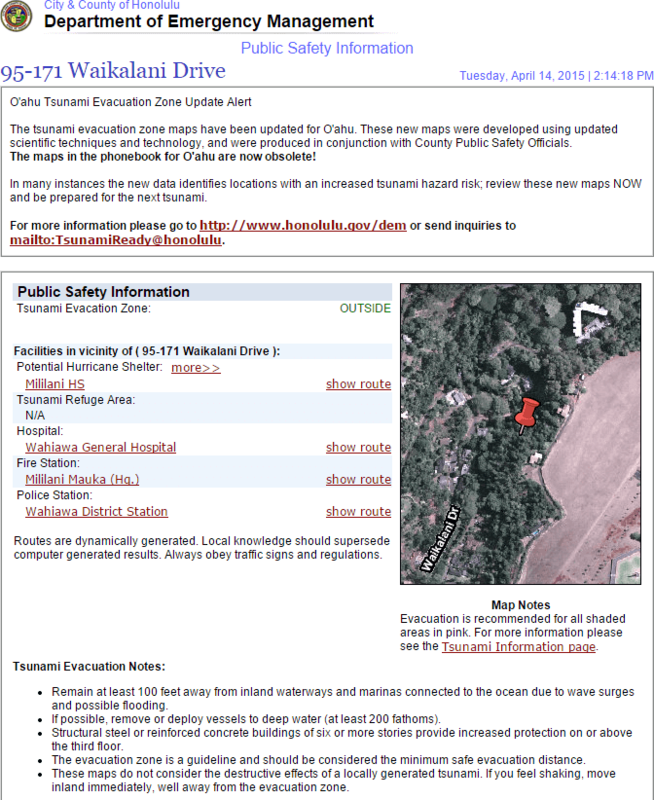 Click on any icon to bring up a photo and some basic information on the property. 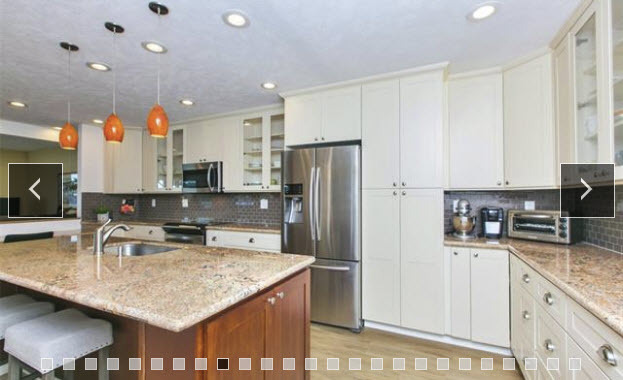 Click again on the photo and view the property detail page. This view is nice as we use Google Maps and do not put it in a small frame but allow it to take up the entire browser window. It is a great way to understand where the various properties are located that interest you. We have many unique and helpful searches. For example, you can search by region, but exclude specific neighborhoods. You can search a specific distance from any property, or from popular locations such as military bases and beaches. 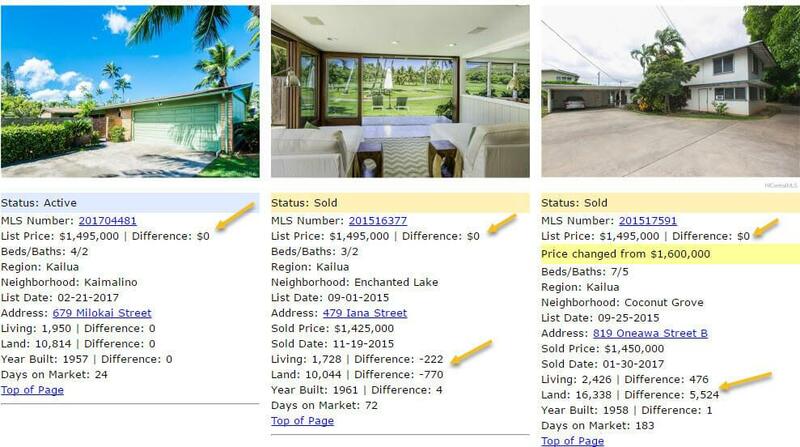 You can search by Seller's Office Name or Buyer's Office Name, Sold Days on Market, Sold Ratio, and Sold Date. We even allow searching the listing agent's remarks for specific keywords such as vacation, rental, fixer-upper, or anything else you can think of. Active 10 Days or Less on Market. Only a status of "Active" is available for sale. If it is not Active you might want to add it to your Watch List to see if it becomes Active again. Active 11 Days or More on Market. The property is in escrow and they are still showing and looking for a backup offer. The property is in escrow and they are not showing the property anymore. Sometimes agents wait until a property is close to closing to change it to In Escrow Not Showing. 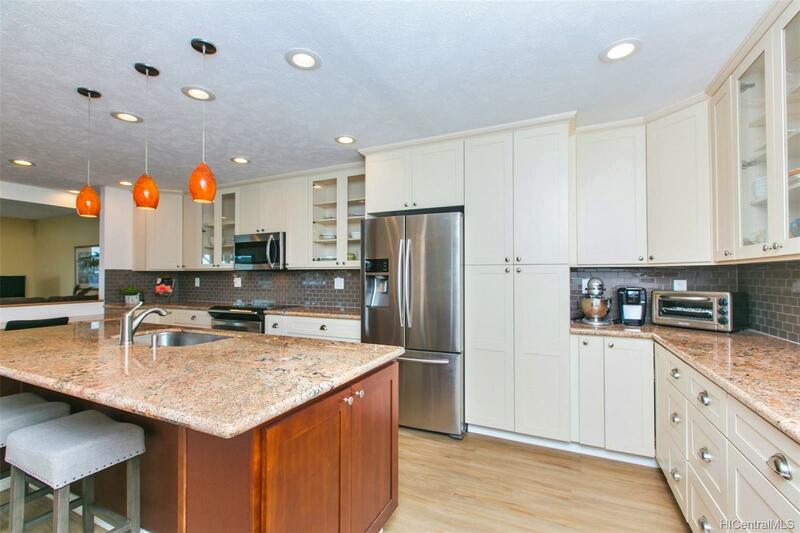 Some sellers prefer not to keep showing as soon as they go into escrow, so this status is added immediately. The property was sold and is now a good comparable sale. 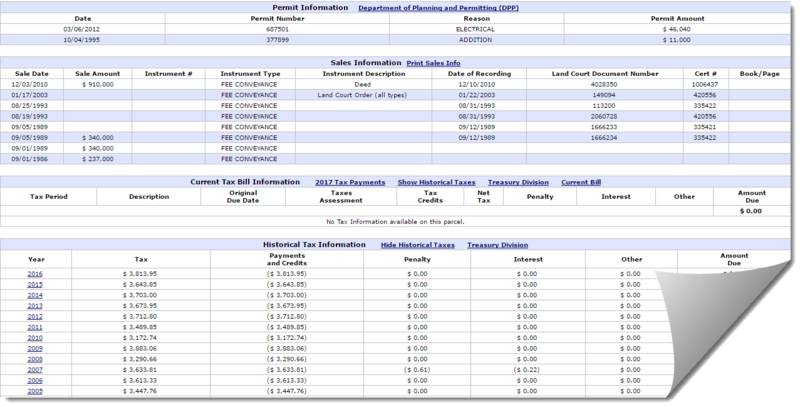 All Withdrawn and Expired status are not available but check the history to see if it was listed under a new MLS#. Withdrawn or Expired properties can be added to your Watch List by TMK# to know when it is for sale again. Every page on our site works well on a mobile phone, and our new Mobile-Friendly Complete Search detects what type of device you are using and adjusts automatically, thereby giving you a great experience on any smartphone. Two screen shots are shown below to give you an idea how the menu and search look like on a mobile phone. This search automatically shows you the nearest listings to your phone's current location. This is great when you are driving around and wondering about Real Estate activity in the neighborhood you are in. See what properties are closest in price to the subject property. The price, interior square feet, and land square feet differences are calculated for you. Understand all the neighborhoods in a specific region. Shows their boundary lines. If you have kids, school districts could be critical to where you want to purchase a home. We allow easy searching by a school district. We also have a one-click search option for the top 20 Elementary Schools. Next to the school we show the grade they received based on the Honolulu Magazine ranking. Pinpoint the location you are interested in on the map or enter any address on the island, then choose how far around that address to search. For example, 1/2-mile, 1 mile, or more. You can also use our location search drop down to choose popular locations to search around including all military bases, hospitals, or popular beaches. You can then view your search results in any one of our popular views listed above. 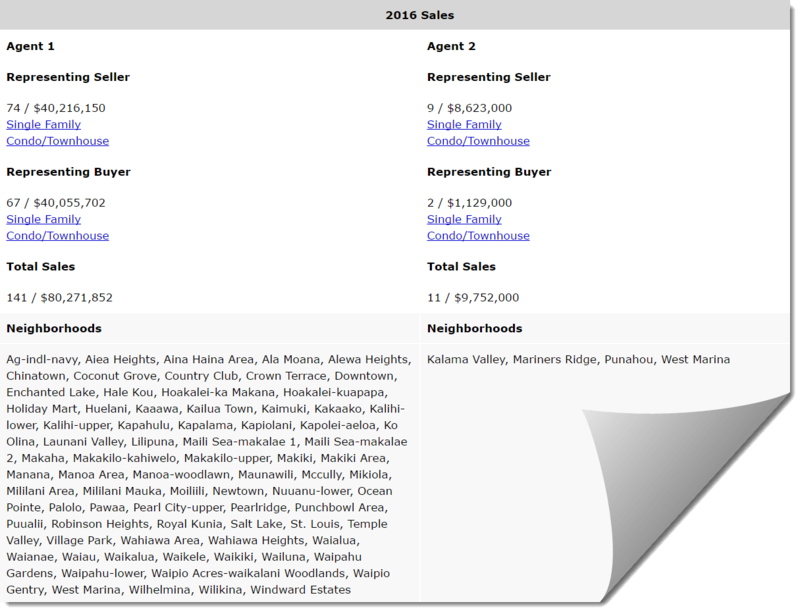 You can now compare sales for any two Oahu Realtors side-by-side. This is a great way to find out how experienced an agent is. We show you their last 6 years of sales, including how many sales they did each year, along with the total dollar volume. 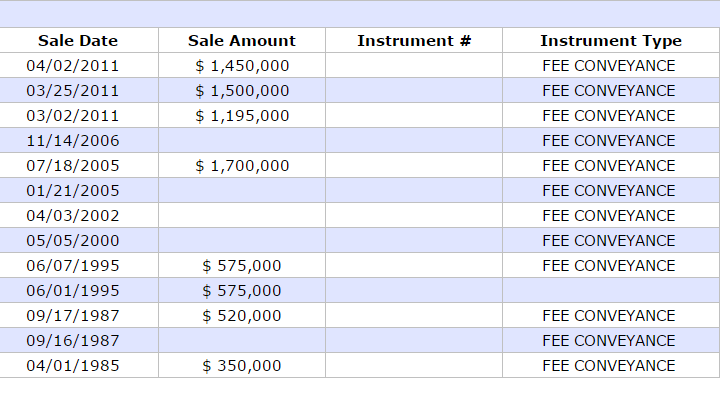 This is separated by sales representing sellers, and sales representing buyers. We also provide the neighborhoods they sold in, so you know where they have experience. A breakdown of their sales by price range is also shown, so you know their experience in your price range. 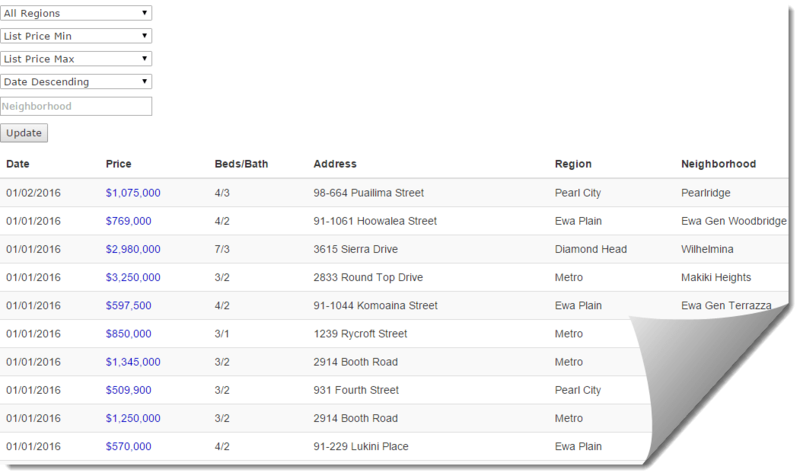 Search by agent name to see the sales history and current listings for any agent on Oahu. No need to ask an agent how experienced they are. We will show you what they have sold in the last 10 years. You can also filter the search by neighborhood, price range, or anything else, to see if they are experienced in your desired area. One of the privileges of living on Oahu is being able to go to the Ocean and to the Beach year-round. Knowing all the Beach and Ocean Access points are important because you want to know what options are close to where you will live. We show all access points including a link for Street View, Directions, and Satellite View. We also list what amenities that access point has such as Restrooms, Shore Type, Lifeguard, etc. We also provide a link from all property detail pages showing you directions on Google Maps to the closest Beach Access Point. 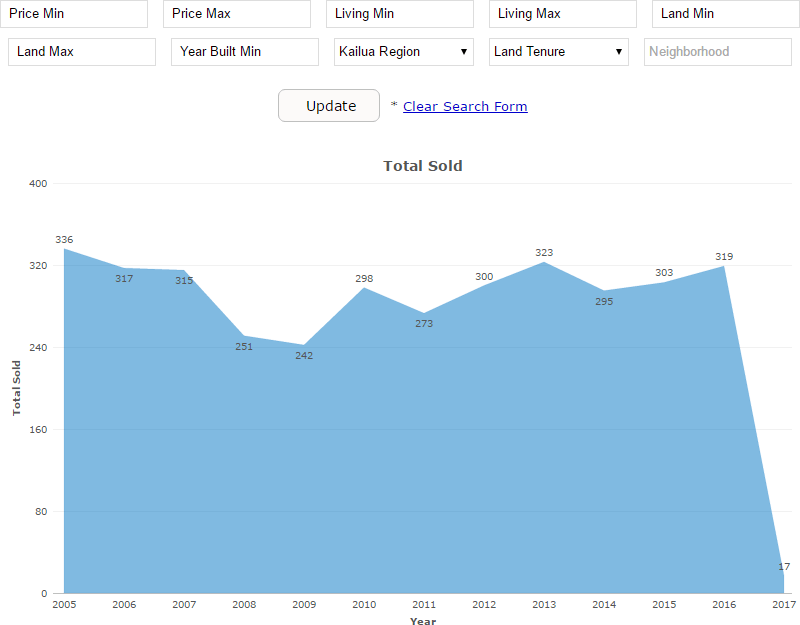 Want to know how the Oahu Real Estate Market is doing? The Honolulu Board of Realtors puts out two very detailed statistical reports monthly, both a monthly overview and a local market update. The report is added to OahuRE.com on the day it comes out and is ready for downloading. A sample page is shown below. These statistics are designed to answer questions such as "How easy is it for me to sell my home?" or "What percentage of asking price will I get?". 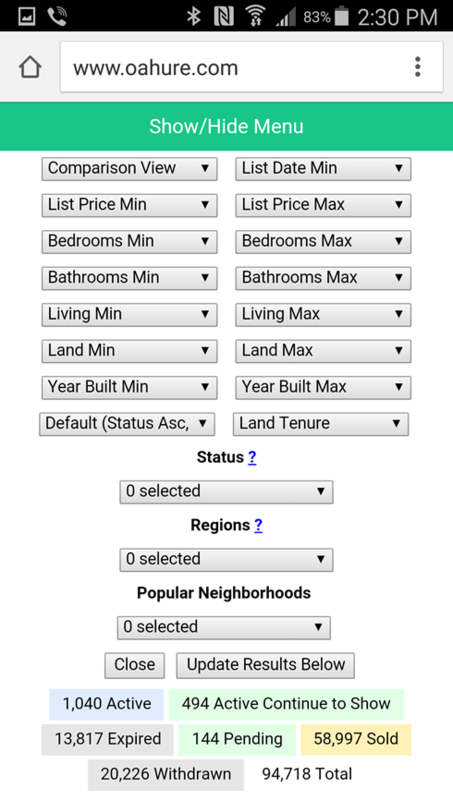 We allow filtering by price range, size, region, neighborhood, building name, and more. Every location has a different story to tell, and you can't get true stats on a location without drilling down to exactly what you are looking for. Our help sections are the most in-depth source of information on the Purchase Contract you will find. We cover all 96 paragraphs of the Purchase Contract, so if you have a question on any paragraph you can easily get answers. 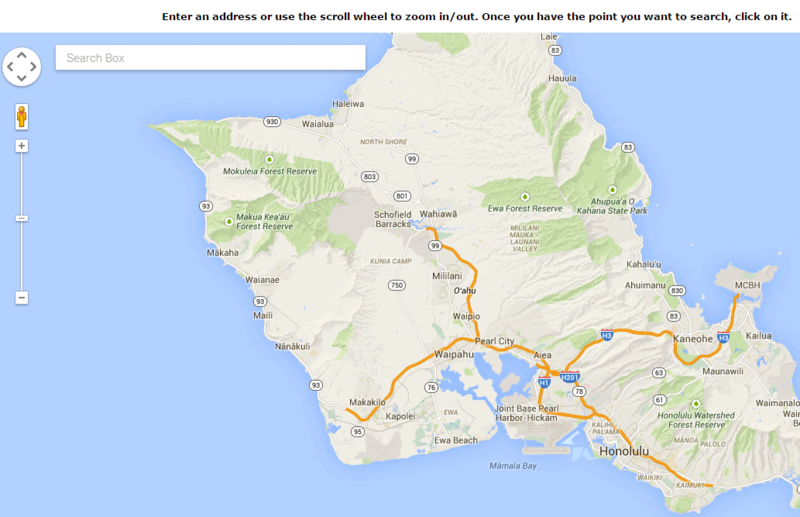 In addition, we answer the most common question you might have when buying and selling Real Estate on Oahu. We also have our recommended vendors for loans and inspections and many other services you need. 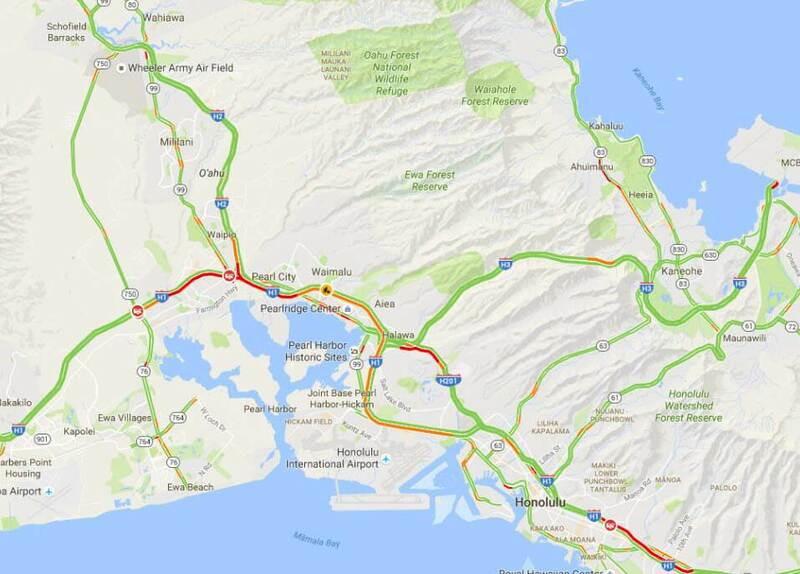 View screenshots that were taken every 15 minutes throughout the day showing Google Maps in Traffic view. See what your commute will be like from various points around the island. You can also see what time of the day might be best to go to and leave work if that is an option for you. Expired and Withdrawn listings are an opportunity to buy a home for less money without a seller's agent involved. The challenge has been finding these listings. Now you can see them easily see them all. We update every 30 minutes, so you can quickly see if there is an expired or withdrawn listing that interests you. One of the biggest challenges buyer's face is getting their offer accepted, especially if there are multiple offers or you receive a counter offer. This calculator will help you see how much you will pay per day to increase your offer. Many people think in terms of the total dollar amount of the increase, but assuming you are getting a loan, the change to your payment can be nominal. For example, at 4.5% interest rate, increasing your offer by $5,000 adds less than $1 dollar per day to your loan payment. It is critical to have this information easily available to help in your decision-making process. Our Mortgage Savings Calculator is unique in that it gives you the total interest paid, and how much interest you can save if you pay extra each month. We also show you interest saved for 5, 10, 15 years, etc., using an amortization table. We do this because we know not everyone will stay in their home for 30 years. While most buyers diligently negotiate the purchase price, they forget that a much larger expense is the interest paid on your loan. For example, a property that you buy at $500,000 with 20% down, ends up costing an additional $329,627 in interest over the course of a 30-year loan assuming a 4.5% interest rate. While you might be able to cut $5,000 off the price of the property during negotiations, you have a much bigger opportunity to save money by reducing your total interest paid. Putting only $100 per month extra would save you $35,400. 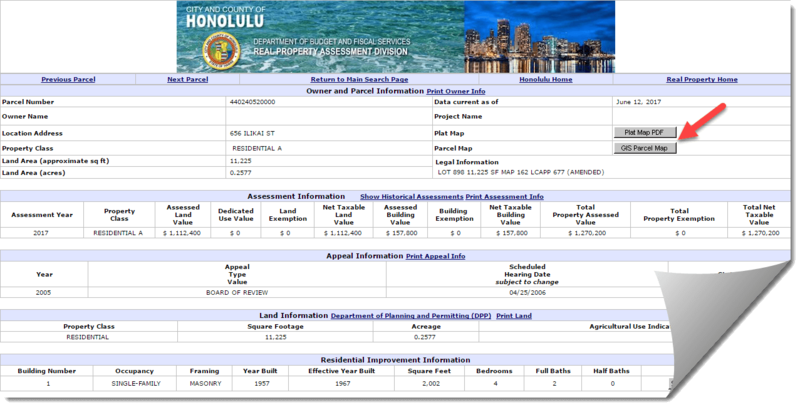 When viewing any listing, with just one click, you can view the complete Tax Information from the City and County of Honolulu's Website. It includes a Plat Map in PDF Format, a GIS Parcel Map, and a Building Sketch. It also allows you to verify the Square Footage and Assessed Value, along with a list of any Permits that were filed, and Past Sales Information, even if it was not sold on the MLS before. We also give you one-click access to the complete Assessed History going back over 10 years. This is for both assessed land and building values and includes the Building Exemption. We also give you one-click access to public safety information provided by the Department of Emergency Management for every listing. We show all permits and you can click on any permit record to see all the details for that permit. We show over 30 years of past sales history including sales that were not done through the MLS. This view shows you all activity sorted my most recent first. This is a great way to keep up with your area of interest. It is easy to tell what has gone into escrow, what was sold, etc. 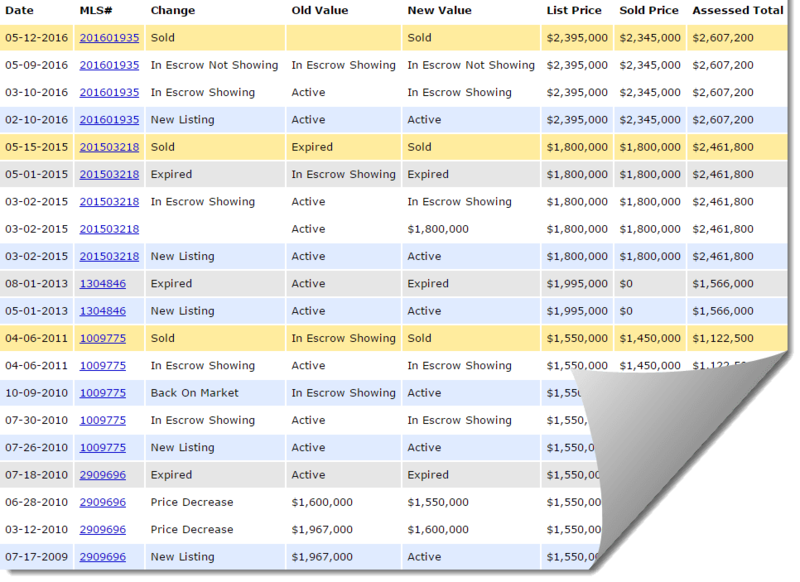 The date order column is shown below in yellow and notice the arrows pointing to the same listing showing when it came on the market and when it went into escrow. 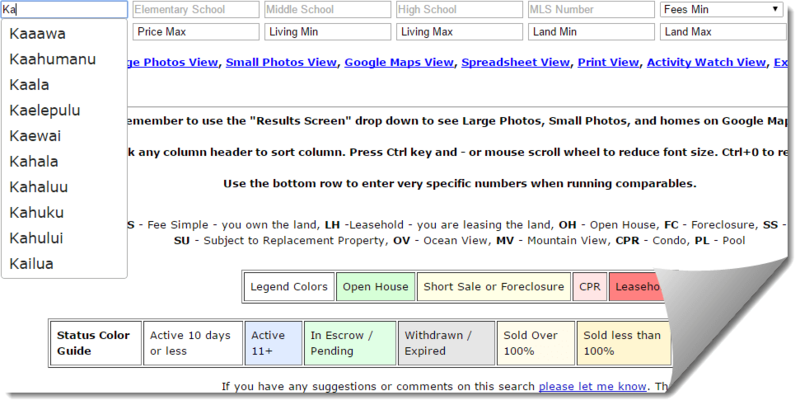 This view shows any listings that are being flipped or sold again within a certain period. The idea is it gives you an idea if the neighborhood is going up or down in price and how much. The monthly estimate includes taxes and fees, plus we let you set your own down payment amount and interest rate. 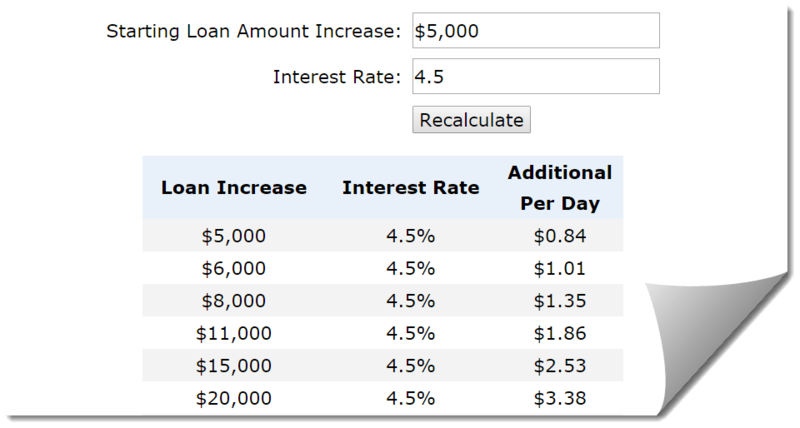 This way each monthly estimate figure is customized based on the type of loan you are getting. 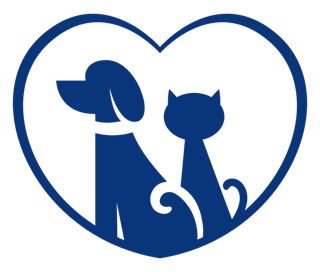 We clearly label the Pet-Friendly buildings using the icon below. In addition, we have called 165 of the most popular buildings to find out first-hand what their pet policy is. We then publish their pet policy on our property detail page, so you know details such as how many dogs, what size, etc.